Tornado Glory aims to accomplish what no movie has ever done: giving audiences the real experience of stormchasing. 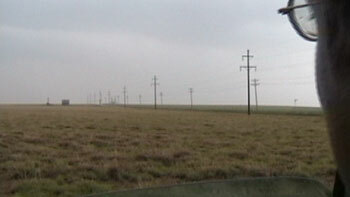 In order to complete this ambitious project, continuous filming was required throughout Storm Season in the Southern Plains. Director Ken Cole filmed thirteen chases with Reed and Joel during Spring 2003, three of which are featured in the movie. Of the thirteen, four chases successfully produced at least one tornado. Joel originally hoped to sell his old Pontiac Grand Prix shortly after the April 5th, 2003 chase for about $3000. As the movie shows, the tennis-ball sized hail put a "dent" in Joel's plans, and he only made about $1000! Reed is currently studying for his meteorology PhD at the University of Oklahoma. Before long we'll have Dr. Reed Timmer! Tornado Glory's musical artists were OU students during post-production. In order to meet tight deadlines, the dedicated crew could only record music in the pre-dawn morning hours during final examination week. On the May 15th, 2003 chase in Tornado Glory, Reed and Joel are in the Oklahoma panhandle, in the middle of nowhere, about to dive south into Texas. Then all of a sudden, Reed gets freaked out by a surprise "explosion". What was that exactly? At the time, Reed and Joel were right under a dying supercell thunderstorm. Was it lightning from the storm? Could it have been the elusive ball lightning? Most likely, this is an instance of a power line fault. If you look closely at the above pictures, you'll notice that the flash occurs right at the intersection of the telephone pole and the power line. A short circuit, or fault, is occurring at that intersection and is generating an incredibly bright arc of light. While similar in brightness to a stroke of lightning, power line faults are actually quite common -- sometimes people call them power flashes. 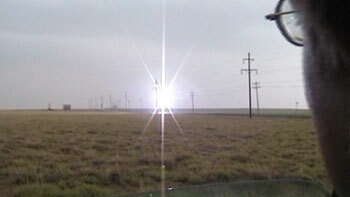 When a tornado passes over a power line, the violent winds will often cause similar power flashes. More more info, check out this site!